Pine Grove was platted by Charles Dake in August 1886. The original platting consisted of a railroad yard and depot, 13 streets and about 350 lots 25 feet wide ranging from 50 to 200 feet long. The town was mainly populated by Denver, South Park & Pacific Railroad workers and summer residents. The area became known for its trout fishing and destination resorts sprang up. Pine Grove Cemetery Association, Inc. was formed on December 4th, 1901. The cemetery started on one lot at the corner of Pine and Second Streets and eventually grew to cover six lots. The area grew as a railroad depot and tourist destination. The natural beauty and outdoor recreation in the area supported several resorts and enticed some wealthy Denver businessmen to build their summer retreats up here. Personal transportation shifted from railroads to highways and popular tourism shifted to other parts of Colorado. The train stopped running through Pine Grove in 1937. The Pine-Elk Creek Improvement Association (PECIA) was incorporated on June 24th, 1947 to do all things necessary to unite the energy, interest and knowledge of both temporary and permanent residents in the Pine-Elk Creek region toward the development and conservation of the natural resources of the region. PECIA is an all volunteer nonprofit corporation dedicated to serving Pine Grove and the surrounding community. The community’s first fire truck was donated to PECIA in the spring of 1948 by Mr. A. W. Weiss. At the May 23rd, 1948 PECIA meeting, Mr. Weiss was appointed Honorary Fire Chief and Mr. Leo Umphenour became Fire Chief. Five members were appointed to the first Fire Committee: Roy Smith, Leland Hoffrath, Miss Hartner, Howard Newhouse, and Tobe. Mrs. Trease donated $25.00 to start a fund toward upkeep of the fire truck and pledged $1.00 per month while she was in town. Mrs. Cozens donated a lot just east of the original Post Office on Main Street to the PECIA Fire Committee. A building committee comprised of Mr. Gaseneau, Mr. Joe Hill, and Mr. Lewis Hoffrath was formed in May of 1949 and the first firehouse was erected on Main street that summer. The building still stands at 16740 Pine Valley Road. 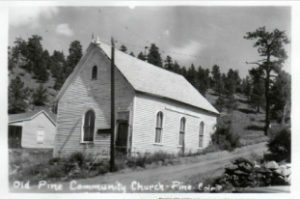 Pine Grove dedicated its Community Center when PECIA bought the Church Building at the corner of 7th & Main from The Church of Christ in August 1949. The building has been an excellent place to have regular meetings, dances, fund raisers, and other community functions. In 1974 when the North Fork Volunteer Fire Department was in need of land for a firehouse, PECIA considered donating the Community Center property for such purpose, but rejected the idea. The building still stands at 16624 Pine Valley Road. North Fork Historic District: Both sides of South Platte River from Pine to South Platte, in Pike National Forest, Late 19th – 20th century. Area which developed around the tracks of the Denver, South Park, and Pacific Railroad (1872). Includes towns such as Dome Rock, Riverview, Buffalo Creek, and Pine, and notable structures such as the South Platte Hotel, which also served as a railroad station and post office, La Hacienda, and the Blue Jay Inn. Contains numerous late 19th century log and frame structures and railroad bed which was graveled over in the 1930’s. Towns developed around growing tourist industry made possible by railroad transportation; growth continued until WW I when tourism decreased. Retains late-19th century appearance. The Annual Rhubarb Festival at the Pine Firehouse in Pine Grove was started by a group of friends who gathered for pancakes and Rhubarb sauce for summer weekend breakfasts. In 1988, the gatherings expanded to become a fund raiser for PECIA and the North Fork Volunteer Fire Department. Just about everybody in the valley has a rhubarb patch, so it was decided a festival celebrating rhubarb was a natural for the community. The celebration begins at 7:00am on the second Saturday in June with breakfast to benefit PECIA: Pancakes, Rhubarb sauce, juice and coffee. A children’s carnival and games is adjacent to the firehouse and live music is provided. A large vendor fair with artisans and crafters and other events contribute to the event. There is a Rhubarb Bake-Off competition and the deadline for entries is 11:00 a.m. Judging of the Rhubarb Bake-off is around 11:00 to 12:00. The winner and runners-up are announced, crowned and aproned, and escorted to their float for the Parade. The Parade is led by the Rhubarb Royalty and often has classic cars, old fire trucks, ugly old trucks, and whoever else happens to be driving through town around noon. If the river is not too high, there is a duck race after the parade to benefit North Fork Volunteer Fire Department. Bake-off entries are sold AFTER the parade.